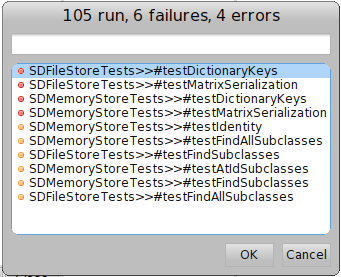 I was trying to migrate a simple image-based persistence app into Sandstone, so I just recompiled my biz objects to be subclasses of SDActiveRecord, but of course the objects I want to save are already created and "floating" in the image, so when I try to save them I get an error as many instvars haven't been initialized upon creating these objects (as they were already there). Is there a way to automatically do this? class is called Person in collection var name people. If Person has an initialize method, rename it to initializeOld. Change superclass of Person to SDActiveRecord. Person warmUp. to setup the store for this new class. rename Person>>initializeOld back to Person>>initialize. Thanks a lot Ramon, I add this to Pharocasts. > Is there a way to automatically do this? this way no need to change the superclass definition of your domain to save your objects. > class is called Person in collection var name people. > If Person has an initialize method, rename it to initializeOld. > Change superclass of Person to SDActiveRecord. > Person warmUp. to setup the store for this new class. > rename Person>>initializeOld back to Person>>initialize. > Thanks a lot Ramon, I add this to Pharocasts. > > Someone knows ? > > Is there a way to automatically do this? > this way no need to change the superclass definition of your domain to save your objects. classes to do queries on all its instances and sub instances. whatever superclass they like as long as it's serializable. I'm still having some trouble migrating the DB... I have an object that holds a Matrix, and whenever I attempt to save the object, SandstoneDB tries to remove elements from the matrix by using remove:, which it shouldNotImplement. Is there an easy workaround for this? > shouldNotImplement. Is there an easy workaround for this? Sounds like a bug, I'll look into it. Pull down the latest code, it should work now. shouldNotImplement. Is there an easy workaround for this? ... but now I've really weird problems when saving a dictionary. I can only save 4 entries, no matter what I do. If I try to add a 5th item, one of the four previously saved ones will be replaced by it. > one of the four previously saved ones will be replaced by it. some more info on your exact configuration? That's weird... here's my configuration: Pharo 1.2.1 using Croquet Closure Cog VM [CoInterpreter VMMaker-oscog.51] on Debian Lenny. My image is quite massive right now, I'll try to get a smaller one with the same issue and send it to you later. one of the four previously saved ones will be replaced by it. Any chance you can send me an image with this issue? Everything seems to work fine here in Pharo 1.1, 1.2, and Squeak. If you can't, then maybe some more info on your exact configuration? to watch ads while waiting for a countdown. I didn't do anything at all, I simply ran the tests and they all passed.